Two Leaves Organic Peppermint tea will answer the question, "can an herbal tea be bold and minty while also soothing and refreshing body and spirit?" 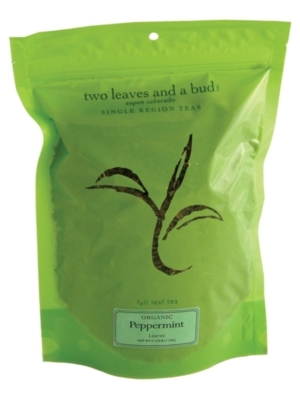 Check out the organic, large cut peppermint leaves; stick your nose in the pouch and inhale the scent; steep those aromatic leaves in hot water and take a sip and see if you don't find the answer. Entirely caffeine free, using all Peppermint leaves and no tea, it's a cozy and perfect after-dinner mint. A zing for your taste buds, rich aroma for your nose and a gift for your psyche.